Affordable Accoutrements: I Love Lenox! Well, perhaps “love” is too strong a word, but I do like Lenox china very much. Very much! This is what I consider my primary set of dishes, a discontinued pattern from the Lenox Presidential Series called “Monroe.” It’s a service for 12+, and I have quite a few of the serving pieces. I like the creamy color and the simple maroon and gold geometric border. However, I thought it might be nice to add variety by sometimes replacing the salad plate with an accent plate. That seems to be a popular trend in table setting. Through eBay searches, I discovered a pattern I liked called Essex Maroon. It was manufactured from 1938 – ’78. I always enjoy seeing the artwork and reading the florid prose used in Mid-Twentieth Century advertising. Here’s a vintage ad from 1951. Ad quote: For beauty famous the world over, Lenox. For you, beautiful Essex Maroon. The richness of 24 kt. gold scrolls and glowing maroon in a superb traditional pattern, one that will bring grace and loveliness to your home for generations to come. Another ad read: For US Embassies the world over, Lenox Maroon. For you, Lenox Essex Maroon. I bought a few pieces to try mixing with the Monroe dishes. I liked the look and watched for a larger set to become available. Soon one did … from an estate in Boston. The condition was perfect (possibly unused). I negotiated a “Buy-it-now” price (quite a bit less than the Eternal accent plates alone would have cost). They were packed in their zippered vinyl storage cases. They’re fine for keeping dust off, but not great as packing material. However, everything other than the saucers arrived intact. I filed an insurance claim with the Post Office. It took a while, because the amount of the claim prevented it from being handled locally. It seemed at first that I might not be able to file a claim at all, because the quality of the packaging was questioned. I think the local Postal workers took pity on me (I wasn’t crying, but I felt like it!). Weeks later, I received a check. I found replacement saucers a few at a time. There was frustration involved. 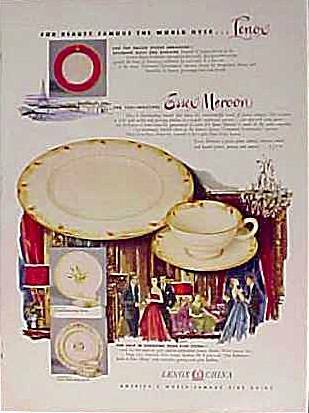 Some of the saucers were marked “Lenox, Made expressly for Ovington’s.” I now know that Ovington’s was an exclusive gift shop on Fifth Avenue in New York. I didn’t mind the backstamp, but I wasn’t pleased that two of the saucers had rim chips. Many e-mails ensued, negotiations, partial refunds. It’s a long story, but I finally have enough saucers (some came with cups, so it didn’t come out even). Anyway … moral of the story? If you purchase fragile items online, insist that the seller NOT use Parcel Post. Priority Mail usually costs only slightly more. I’ve been told that Priority packages are handled with greater care and make far fewer stops along the way. Always buy the insurance. However, that does no good if items aren’t packaged to the satisfaction of the Post Office. Look at feedback for the sellers, paying particular attention to comments on how well items were packed. What about you ... have you heard the dreaded "rattle of death" when you received a package containing fragile items? Sadly, this isn't the only time I've experienced it. It's never fun. I think I’ll set a table for you with my Lenox dishes. Would you like that? Oh no, Bill. I was almost crying and they aren't even mine. Death rattle, ha. Now the pressure is on me for my packaging. Going out soon. I really like the looks of the Essex more than the Eternal. Maybe the Eternal would have faired better en route being eternal and all. Oh my! You can just tell by that box that things on the inside are gonna be pretty. I love that pattern though - very pretty! Sorry you had such a hassle ... geesh! Oh my word Bill. Essex Maroon was my pattern when I was married in 1966. I loved it! Homewood by Steiff was my silver. Over the years and too many moves, I no longer have it all. What a small world! What a giant pain, Bill after getting a GREAT find for it to end up partially broken...what was the seller thinking anyway? Glad you got some relief with the insurance check. Would love to see this china in a future tablescape. Oh, I looked at that box and then the broken china but it is amazing that you only lost what you did! I've bought many things on ebay -- china and if I had any complaint it would have been too many peanuts! (But at least everything arrived in tact). Glad the PO worked with you -- a long time ago I had a problem with ours -- being a) government and b) small town, they didn't want to do the paperwork and told me that the sender needed to do it -- I informed them that the sender was now here (my husband). End result was that we never got satisfaction and they would not file the claim! It is beautiful china -- both sets. 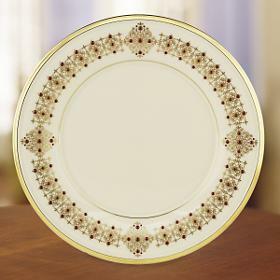 I have Lenox Christmas plates and some lovely white bowls that I sometimes serve soup or salad in. Oh my! So sorry about the china. Dealing with the PO alone can turn you gray if you are not already. I have had a couple of minor episodes with them in the last few months. Oh what gorgeous china and what a story!! I am so sorry you went through all that! I bought 12 Lenox Christmas (holly) dinner plates and a few other pieces, when Lenox was closing the outlet, in Tennessee a couple of years ago, when we were on our way to see Biltmore, at Christmas. I really looked them over good and found few flaws. I've collected Winter Greetings Everyday, for several years. Those are the only Lenox dinnerware patterns, I own, plus a few pieces of "gift" Lenox. I worked in China, Crystal, Silver at Famous Barr in the STL area. That store is now Macy's. I learned so much while working in that department. That was in the early 80's. Hope your Dad is much better. I too suffer the same heartbreak when a set of Limoges was purchased through eBay and not packed properly. Lucky for me it was a huge set. After the insurance reimbursement I'd only paid $60 and still have 10 full place settings and serving pieces. I have my grandmother's set of Lenox Rose, I'll use it on a table soon. Have a good weekend - see you in blog land soon! I feel your pain. It's happened to me a few times. However, I've been fortunate(at least so far) in that only one or two pieces were impacted by the shipping. By the way, I also love Lenox and your primary set is gorgeous. Have a great weekend. Oh no, so sorry that you found this. 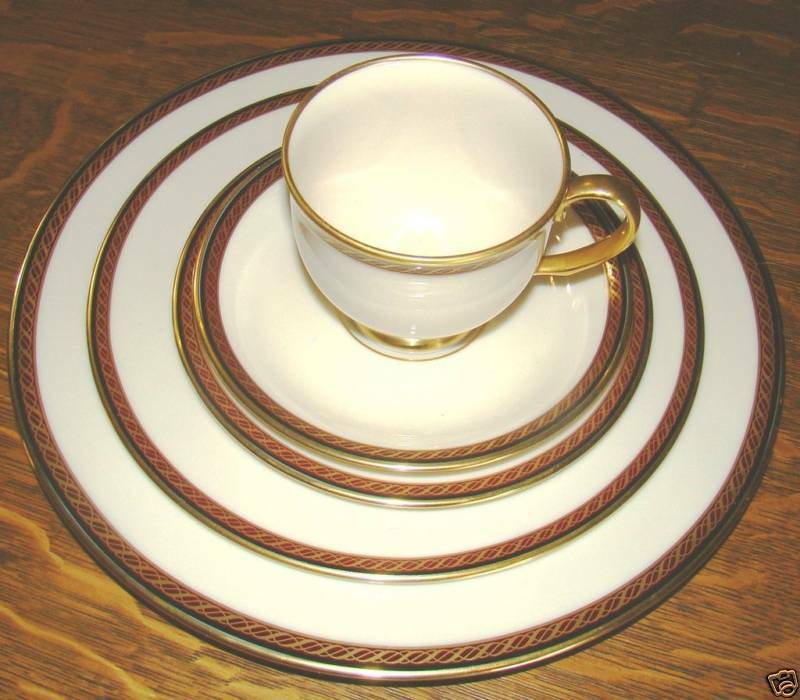 Your dinner set is wonderful, I love the combination of the cream, maroon ( such a gorgeous colour) and gold. You have an elegant set. Oh Bill...I wanted to cry for you! What a mess. I sorry you had such a hassle. But the pattern is very pretty. I like it! Were your ears burning earlier today? I was telling my mom about my new 'blogging buddy in TN who has some beautiful china and flatwear' that she just has to see. She doesn't have a computer, so I'm going to have to get her over to my house so she can take a peek at your blog. Have a good weekend! Yes - I've heard that death rattle too - unfortunately -- And when I filed a claim at the good old USPS - they insisted that I had to turn over EVERYTHING from the package - even the pieces that were unbroken! Your Lenox is lovely -- I can see why you admire it so! Hope your Dad's doing well and continues to improve. The dishes are beautiful, and I'm sorry to hear about your frustration with the broken saucers. Regardless of the careless packing, one look at the outside of that box shows that it was likely bounced around by the post office. I've had one incident involving receiving a damaged item I bought on eBay, so I can relate to your frustration. The shipper was DHL. Unfortunately, DHL requires the seller to file the claim. After weeks of getting nowhere with the seller handling the claim, I made him sign it over to me. I was able to settle the claim via e-mail and received a check within days. Your suggestion to check eBay seller's feedback rating for comments regarding packing when you buy breakable items is good advice. Bill, how frustrating for you. After waiting and waiting and they came in broken. I'm glad after all the hassles you finally got things settled and could move on to find some replacements of sorts. It is a beautiful pattern and I'm sure we can look forward to a tablescape or two soon right? Hope you're having a good week end..
Bill in response to your comment yes you did get robbed. 99 cents! Oh my. I paid zero. Nada. It was a gift from someone in my coffee group. They loved Portugal. I would have started crying when I saw the box. You just know by looking at the box you are going to hear that dreaded rattle! Aghh! I too love Lenox. I really am a traditional, classic girl at heart. Well, there was a lesson learned here, Bill and I am glad you passed it on. Still, I am sorry for all of your troubles. The dishes are absolutely gorgeous! Yes, Bill, I have received boxes full of shards that jingle, jangle, jingle --- it's heartbreaking! Thank goodness you were able to wangle some settlement out of the P.O. Not always easy. And it's good that you have a few extra cups -- they are the pieces most often lost or broken. My mother always ordered 3 extra coffee cups when she ordered new china. Lovely choice to complement the older Lenox set. Nice! I have never received anything broken in the mail; however, while unpacking my stuff this past month, I have several things in several boxes that were broken! Ugh! You just know those movers threw those boxes in in a hurry. Sorry about your broken ones, but I'm glad you finally got a complete set. I was horrified when I saw the parcel pic because I knew what was coming next! I have felt the horrible feeling in the pit of my stomach too meny times to mention but this was the most recent. If you have time to look this was my blog post about it. Bill, What heartbreak and unnecessary trouble, if only the seller had gone to a ups store and had them pack...I am sure you would have agreed to help pay for the cost or they should include that in the price. Sorry you had such an ordeal to get some dishes, but they are beautiful. I am anxious to see how you mix and match them. Oh, what a shame about all those saucers. I recently had a glass eBay purchase come broken. I was only refunded for the price of the item, and not the shipping and insurance, which was about $10. I was not a happy camper about that. Oh my gosh! What a huge disappointment! I can't wait to see the others in a tablescape! 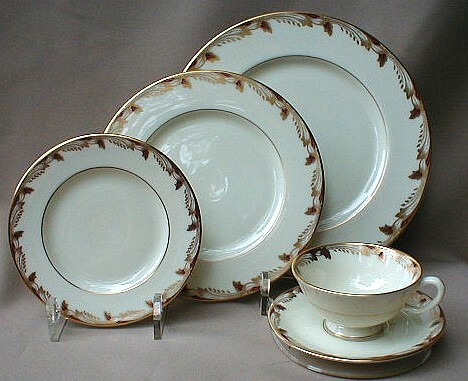 How beautiful your dishes are, and such a wonderful search for other China to go with your set. I would have cried! Oh, the disappointment! Had to be so Bad! But now in the end you have made it all come together! You are so lucky to find more if not the same exact but, maybe you will find them and offer the others up for sale. I been hitting Craig's List and Mississippi/Alabama Classified, so much fun. I sent Susan an email of Johnson dishes for sale with serving pieces for 100.00. They were pretty but we both passed. lol Pray your Dad is doing much, much better! Oh my goodness Bill!! My heart hurt when I saw the box and I knew what was coming, just not the extent of damage! Bless your heart!! I am sure your tablescape will be fabulous with the others! Can hardly wait for your next table!! I got a huge knot in the pit of my tummy when I saw your broken dishes. Yes, I had a terrible experience, also with an Ebay seller. I collect German Blue Windmill (aka Delft) cannister sets. I purchased one on Ebay and when I received it, almost all the pieces were broken. I just sit down and cried..(being a girl, I can do that!! :)..the seller just didn't know how to pack, I suppose. ANYway, I now ask that they use double boxing and pay the difference. I hope your father is doing well..we've all missed your smiling face and fabulous posts. Bill, that is so great your Dad is getting out! Our Dad's are near the same age. Mine has been camping, out on the four wheeler and visiting friends all week. He has heart problems too. I love to hearing they are enjoying life! Bill, I'm on blog break checking in, and I just read about your dad! How terrifying. Hope you are sleeping better now that you know he's going to be fine. Thank goodness for that stent procedure. Just said a prayer for him and for you, too. In answer to your question... yes, I've received broken china and crystal. It is nerve-racking for sure. I have learned to always ask them to wrap it individually with bubble wrap (and to use the big kind), to pack with packing peanuts, and to double box the items. I tell them I've had a bad experience and don't want another bad experience with fragile items. That is horrible that the first guy crammed that beautiful china in a box inside of its dish container. Obviously, they knew nothing about packing fragile items. It's a miracle the rest of it got to you in one piece. I've had big china replacement companies break things, too, so even experienced sellers can spell disaster. UPS once told me to tell the seller to wrap the things as if they will be dropped from shoulder height because they are dropped on the conveyer belts at the facility. I always tell people who are shipping through the post office that I want bullet proof packing. I'm just so sorry this happened to you. Hopefully, the beauty of the china will make up for it. Oh my goodness, what a story, so sad to see beautiful china broken! Can you do a mosaic with the broken pieces? Seriously! 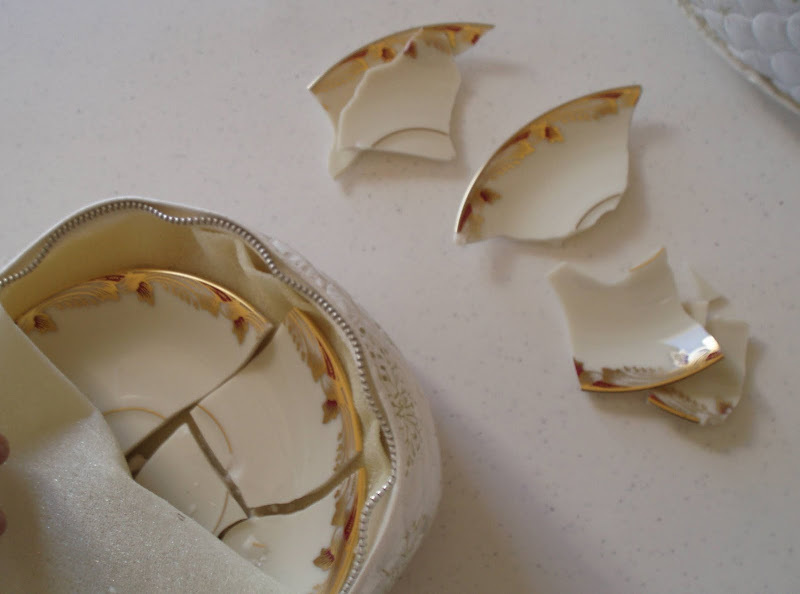 There's a couple of lady bloggers who do beautiful things with broken china. Yes! Set the table with your lovely Lenox! Tablescaping - good for what ails ya!! I hope your dad is doing well. Thanks for your sweet comments on my roosters/hens! I am pleased to have discoverd your blog! Nice tablesetting! I see that a lot of people do effort to do the right tablescaping! And with such beautiful items here on your post of today, it will be top of the bill!!!! So far my ebay purchases have been ok for dishes. But I did have an odd thing happen with a second hand book from Amazon. The book arrived and it was cut in the middle of the book from the cover all the way to 130 something!! I couldn't believe it. It looked like a box cutter had gotten it--it was a very clean cut all the way through....the book dealer issued me another one. Dishes would be a much greater loss! wow, it is so cool that you found something to coordinate with your Lenox pattern. I did the same thing. I have So. vista and will post soon about a pattern I found, Syracuse forget Me not. from the 60s. You'd be proud of my silverware $24 snag recently too. they go well w/my faberware. I missed you while you were gone...sorry you were nursing a loved one. Hi Bill! I just saw this post.... I have this china. It was my grandmothers and I have a service for 12. It sets such a beautiful table. I'm so glad you found replacements for the ones that broke. OMG! So glad you could find some replacements! for this beautiful dishes...my goodness, what can happen to fragil and delicate items, it's to sit down and cry for...so glad for you Bill.